We’d love your help. Let us know what’s wrong with this preview of Rise of the Darklings by Paul Crilley. Emily Snow is twelve years old, supporting herself and her younger brother on the streets of Victorian England by selling watercress. One early winter morning on her way to buy supplies, she encounters a piskie--a small but very sarcastic fey creature that has been cornered by a group of the Black Sidhe, piskies from an opposing clan. She rescues him and unknowingly become Emily Snow is twelve years old, supporting herself and her younger brother on the streets of Victorian England by selling watercress. One early winter morning on her way to buy supplies, she encounters a piskie--a small but very sarcastic fey creature that has been cornered by a group of the Black Sidhe, piskies from an opposing clan. She rescues him and unknowingly becomes involved in a war between the Seelie and the Unseelie, two opposing factions of fairies that have been battling each other throughout the long centuries of human history, with London--and England itself--as the ultimate prize. When the Invisible Order--a centuries-old secret society of humans that has protected mankind from the fey's interference--gets involved, things really start to get complicated. To ask other readers questions about Rise of the Darklings, please sign up. I do like this book, and the author did a great job with the faerie theme. This book is pretty dark and violent, as a warning to younger readers. Overall, I felt that the plot was interesting. Things that seemed too contrived in the beginning, but began to make sense as the story progressed. All the different places that Emily finds herself during her journey really adds to enjoyment of the story; it seems like a real adventure. Also, they really have you wondering who can be trusted and what everyone's true motives were. I have complaints about the story though. The first, is that it seemed rather obvious to me as the story went on, how Overall, I felt that the plot was interesting. Things that seemed too contrived in the beginning, but began to make sense as the story progressed. All the different places that Emily finds herself during her journey really adds to enjoyment of the story; it seems like a real adventure. Also, they really have you wondering who can be trusted and what everyone's true motives were. I have complaints about the story though. The first, is that it seemed rather obvious to me as the story went on, how the faye knew about Emily. Second, the story takes place over only three days, but really it seems that they packed way more into those three days than should be possible. Or maybe, when you go on an adventure where the stakes are that high, you really can accomplish that much. I love the description in this story. I could see both London as it was then, but even more, I could see the fay perfectly. I felt that the beginning was the most intriguing part of this novel. It was the unique world Crilley created that had me devour the first half of this story within a few hours the other day. I did not realize, when first requesting this book to review, that The Invisible Order series is based upon the fey. Well, that's a lie. I knew at the time, then conveniently forgot. So, when the fey were introduced, I was pleasantly surprised. Let it be known that this is not your typical fey book. They fey I felt that the beginning was the most intriguing part of this novel. It was the unique world Crilley created that had me devour the first half of this story within a few hours the other day. I did not realize, when first requesting this book to review, that The Invisible Order series is based upon the fey. Well, that's a lie. I knew at the time, then conveniently forgot. So, when the fey were introduced, I was pleasantly surprised. Let it be known that this is not your typical fey book. They fey in London are a group who have created their own divisions of the Seelie and Unseelie courts. We do not have the winter and summer courts here, folks. There's actually a jab at Oberon at one point which made me laugh. But aside from Oberon? All of these faeries are unique, original, and intriguing. For once, I actually wanted to learn more about the world of faerie to better understand the creatures lurking about London. It was an entirely new concept, and that is what made RISE OF THE DARKLINGS have such a strong start in my eyes. While I enjoyed this story, I did have a few problems with it, particularly with the ending. After the first half of the book, I felt the story soon grew rushed. Instead of paying attention to detail (by the way, there's virtually no showing in this book), many of the scenes are skirted over. Or at least, it felt like they were to me. To others, perhaps it was perfect. I felt that the scenes where Emily succumbed to her emotions were melodramatic. I was unable to relate with her or feel for her throughout these brief interruptions because it grew increasingly more and more difficult to connect with her as a character. In my mind, the story was generally smooth, only to hit turbulence as Emily acknowledged the stresses around her. These moments came out of nowhere and interrupted my enjoyment of the novel. Now, before people start blaming me for missing anything, or hating on Emily as a character, let me say that I can understand why she did have these moments. It was a step in the right direction when it comes to fleshing a character out. That's not my problem. My problem is that I'm not pleased with the execution of these moments. Why? Because I could not feel sympathetic due to my disconnect with her as a character. I felt Jack, Corrigan, and a lot of the fae were the most developed in this book. Emily and William disappointed me, much like the ending. Emily is a strong heroine, yet, due to the lack of showing and a lot of seemingly rushed through scenes, she is somewhat more difficult to relate with -- more so because she comes off as snappy and irritable most of the time (a quality that I disliked in this heroine). As for William, well, he barely plays a role in this book, and the role he does play is quite... childish. Rise of the Darklings is the first book in a series (of at least 2 books). I received a review copy from Amazon Vine and rom a high level, the premise reminded me a bit of the Spiderwick or Fablehaven and other recent books…you have a young girl, Emily, who is able to see the magical world of faerie/fey creatures living among us. And she has a fun adventure because of this gift of sight. There were a few things that differentiated this book from those series…the first being that this book is set Rise of the Darklings is the first book in a series (of at least 2 books). I received a review copy from Amazon Vine and rom a high level, the premise reminded me a bit of the Spiderwick or Fablehaven and other recent books…you have a young girl, Emily, who is able to see the magical world of faerie/fey creatures living among us. And she has a fun adventure because of this gift of sight. There were a few things that differentiated this book from those series…the first being that this book is set in Victorian England rather than the present day. Added to that is the fact that Emily is a poverty stricken orphan working by selling watercress on the streets. I love faery stories, so I was very excited when I started reading Rise of the Darklings and realized that I had, in fact, just dived into a deliciously traditional faery story. This first book in The Invisible Order series, though aimed at fifth to eighth graders, is a deeply satisfying read even for adults, full of twists, turns, and lots of excitement. Twelve-year-old Emily Snow has a tough life. She has scraped a living for herself and her younger brother William by selling watercress on the I love faery stories, so I was very excited when I started reading Rise of the Darklings and realized that I had, in fact, just dived into a deliciously traditional faery story. This first book in The Invisible Order series, though aimed at fifth to eighth graders, is a deeply satisfying read even for adults, full of twists, turns, and lots of excitement. Twelve-year-old Emily Snow has a tough life. She has scraped a living for herself and her younger brother William by selling watercress on the street ever since their parents disappeared, but their meager-yet-stable existence is threatened when Emily stumbles upon a battle between two fae factions. She quickly learns an important lesson: never trust a faery, and after William is kidnapped, Emily and her thief friend Quick-Heeled Jack must decide who to believe if they want to prevent a faery war that could destroy London. Author Paul Crilley has created a fascinating world. Emily’s London is cold and dreary, the perfect setting for a story of abandoned children. The setting itself brings to mind Dickensian London, full of lost children and dirty fog, perfectly poised to split apart and reveal hidden worlds that existed long before humans gathered on the banks of the Thames. I was very impressed by Crilley’s parallel worlds, linked together only for those who have the sight–those who can see the fae. The story takes a little time to really start rolling, but the deliberate pacing at the beginning enhances the feeling of impoverished desperation that Emily has to live with every day. When she stumbles across the faery battle in an abandoned alley, the sudden shift in pace–from slow and hopeless to quick and dangerous–jolts you out of the bleak world Crilley has created and pushes you into the strange world-between-the-worlds along with Emily. The descriptions of the fascinating faery places, from the Seelie Queen’s city within an enormous tree to the Landed Gentry’s–gnomes who desperately want to be like humans–village made of the detritus of human life, are gorgeous and immersive, as is the action. When Emily and Jack have to break into The Invisible Order’s headquarters–a human organization that may or may not want to eradicate the fae–I was on the edge of my seat. Emily herself is a girl brave and intelligent beyond her twelve years. To a modern audience, the idea that a twelve year old could scrape a living to support herself and her brother is startling if not a bit unbelievable, but Crilley sets it well within Victorian London, and he writes Emily in such a way that you really believe she has been forced to grow up too quickly. She can take care of herself and watch out for others, but at the same time, she’s still a little girl who desperately wishes her parents would come back. I thoroughly enjoyed Rise of the Darklings as an adult reader, and I think it would be just as satisfying to a young reader as well. It’s intelligently written along the lines of J.K. Rowling’s Harry Potter series, and it is definitely engrossing. I can’t wait for the next book in the series… especially after the cliffhanger at the end of this one. I got an advanced reading copy of this book through the Amazon Vine program. The synopsis of the book sounded wonderful; a young girl in Victorian London stumbles upon another world. I absolutely loved this book. 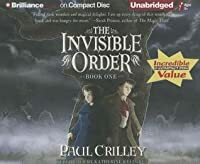 This is the first book in The Invisible Order series by Crilley. The characters and story were very engaging and the atmosphere dark and mysterious. Excellent middle grade fantasy that even adults will get into. Emily and her brother are orphans trying to scrap buy in the Cheapside part I got an advanced reading copy of this book through the Amazon Vine program. The synopsis of the book sounded wonderful; a young girl in Victorian London stumbles upon another world. I absolutely loved this book. This is the first book in The Invisible Order series by Crilley. The characters and story were very engaging and the atmosphere dark and mysterious. Excellent middle grade fantasy that even adults will get into. Emily and her brother are orphans trying to scrap buy in the Cheapside part of London. Emily sells Watercress at market and tries to make enough money for them to eat. One day on her way to the market she stumbles upon an epic battle happening in the streets on London; but the people fighting it are peculiar and...small. From there Emily finds herself drawn into an adventure under the streets of London, on a quest to save her brother and possibly her parents, dealing with the horribly unpredictable fairy folk. I loved this book. The whole book has a dark Victorian atmosphere to it and the descriptions pull you right into your surroundings. The plot is full of twists and turns and you never know what you are going to find with each page you turn. Emily is a wonderful character; she is realistic, plucky, takes on a ton of responsibility for her age, has a lot of backbone, and at times is quite witty and sarcastic. The surrounding characters are all quirky and interesting. I enjoyed the complicated politics between the Fairy King, Fairy Queen, and the Invisible Order. This is a middle grade book that assumes its readers are intelligent people who love a good story. At times this story channels some dark fairy tale-like elements too. The writing was easy to read and very well done. The pace perfect, I never got bored and never felt overwhelmed. This book was very hard to put down and I read it in record time. The story is well wrapped up, but leaves some open story threads for the next book. I am really looking forward to reading more of this series and so glad I decided to read this book. Emily Snow lives in Victorian London scraping out the best life she can for her and her brother since their parents mysteriously disappeared. It's a hard life but she's protecting William and keeping him fed. All starts to change on early morning while Emily takes a short cut through the alley's of London when she comes upon a fierce battle being fought by creatures who stood no "higher than Emily's knee". "What had she just witnessed? were they goblins?Gnomes? Faeries? They couldn't be, surely? Those kinds of things didn't exist". But of course they do and Emily is drawn into a fight between two faerie realms and the Invisible Order, a group of humans who have been fighting this battle for centuries. Emily tries to mind her own business, but get's drawn into it by helping Corrigan, a piske who was a thin and stick like creature about 3 times the length of her index finger, who had been injured in the battle against the Black Sidhe. Emily finds out that creatures of Faerie live all around them, but that most humans simple can't see them. As she gets drawn further and further into this conflict it's interesting to see Emily struggle with who to believe and who she can trust as each of the three parties plead their case and try and convince her to join their side. I love Urban Fantasy's, and this book is well written so it's easy for me to recommend it especially for the Middle School age group it's written for. I prefer books that have a clear ending, even though you know the battle or struggle isn't over and there will have to be another story to follow instead of just being what amounts to the chapter before the next book begins, but that may just be me. Ever since their parents disappeared, 12-year-old Emily Snow is the sole supporter for her brother, William. When Emily sees a piskie battle in a London alley, she ends up being an unlikely witness and rescuer of one of the fairies named Corrigan. Emily soon finds herself pitched between the Seelie and Unseelie courts and their mutual hatred for the Invisible Order, a secret society of humans who hold back the fairies from their dreams of incursion on the human world. When her brother gets kidnapped by one of the fairies, she must enlist Corrigan's help to solve a magical riddle that will lead her to a stone that is the key to the Fairies and the London Underground. If she doesn't find the key and keep it away from the fairies, the human world as she knows it will never be the same. Will Emily be able to save the humans from a fairy invasion? Will she find a way to rescue her brother? First of a new middle-grade fantasy series that's set in Victorian London about a girl (hurray, a girl!) who's struggling to keep herself and her younger brother sheltered and fed since her parents disappeared. She's on her way to work early one morning and inadvertently sees a battle among some short, fairy-type people in a dark alley. One thing I liked about this book is that the action is led by a girl, who's had to take on some heavy responsibility. Setting the book in the realistic past is First of a new middle-grade fantasy series that's set in Victorian London about a girl (hurray, a girl!) who's struggling to keep herself and her younger brother sheltered and fed since her parents disappeared. She's on her way to work early one morning and inadvertently sees a battle among some short, fairy-type people in a dark alley. One thing I liked about this book is that the action is led by a girl, who's had to take on some heavy responsibility. Setting the book in the realistic past is also a nice twist on urban fantasy. Regular readers of fantasy will recognize many of the tropes--war between humans and factions of faery. This novel also throws in some tantalizing bits about time travel that are not resolved in this first book. I really loved this, and I can't wait to get my hands on the next book. Emily is such a strong and remarkable character, William reaminds me alot of my little brother, Jack well I just adore Jack, and Corrigan where would we be without a sarcastic little pisky?? I'm aware of the fact this is considered a childrens book, but I think it is a book for all ages. I just absolutely loved it!! Huh, I think I'm a bit disappointed. Not in the book, I should hasten to add, but because it felt like it was setting up a whole series of children's books involving time travel, the Invisible Order, and fae. I'm disappointed to discover that there's a sequel and that's it. It's a fun children's fantasy book set in Victorian London (or thereabouts) and it's key enjoyment is in how visually rich the details of the fae are. There's a sense that it would make a mesmerising tv series if you could get Huh, I think I'm a bit disappointed. Not in the book, I should hasten to add, but because it felt like it was setting up a whole series of children's books involving time travel, the Invisible Order, and fae. I'm disappointed to discover that there's a sequel and that's it. I gave this one a chapter or two, but the writing was poor, the characters not terribly compelling, and the mood dark and dreary. I can forgive dark and dreary when the other two are in order - and when there's clearly a good story at the core - but this felt like work to read. Throwing it back into the sea for another catch. This review has been hidden because it contains spoilers. To view it, click here. It was really gooid except for the sort of cliffhanger at the end. My favorite part was when the neither the Queen or Dagda got the key to Faerie. My least favorite part was when Mr. Ravenhill betrayed the Invisible Order. What an adventure! Though not one a twelve-year-old should have to go through. A fantasy book for younger readers but with the caution that it has some very dark parts! I was struggling to work out what age it was written for as some parts are aimed very much at younger children and are written simply and basically. Other parts are very dark and I wouldn’t want too young children to read it alone. An enjoyable story but not as fun a fantasy as I wanted it to be. About the Book: Emily Snow's parents have disappeared and for the past two years she has been in charge of her younger brother and making sure they survive. One morning, Emily encounters a conversation between strange beings and realizes she can see a entire hidden world in London, full of faeries. A war is raging between faeries. As Emily's brother is kidnapped, Emily must do everything she can to save him. But what side is good? What side will not destroy humankind? Emily must find the key to About the Book: Emily Snow's parents have disappeared and for the past two years she has been in charge of her younger brother and making sure they survive. One morning, Emily encounters a conversation between strange beings and realizes she can see a entire hidden world in London, full of faeries. A war is raging between faeries. As Emily's brother is kidnapped, Emily must do everything she can to save him. But what side is good? What side will not destroy humankind? Emily must find the key to save her brother and help save London before faeries take over. There's a lot to like about this book, but here's my primary positive thought. It's easy to write la-la-faeries-in-the-garden diversions. It's not easy, but pretty common, to write very complex and twisty faerie stories that get so caught up in the details of the Seelie Court, the Unseelie Court, and so on, that they read more like histories of the Prussian Empire than like adventure stories. This book treads the very narrow path that avoids the twee on one side and the tediously complex on the other side, and the result is a remarkably engaging Faerie based adventure. Emily is a twelve year old girl who finds herself caught between the warring Seelie and Unseelie Courts, and a person of interest to the human Invisible Order that opposes all of Faerie. She has a brother, William, to protect and a companion, Jack, who injects just a slight touch of budding romance. Once she pierces the Faerie glamours and sees the true magical world around her she is drawn into a perilous quest, with little guidance and no one to trust. The author manages to keep the narrative tight and focused, and the action unrelenting and propulsive, while still filling in this alternate Faerie world, with all of its myths, legends, histories, colorful characters, creatures and conflicts. This is a demanding juggling act and for the most part the author succeeds. Emily is resourceful, spirited and kind, and these virtues stand her in good stead as she faces physical, emotional and magical challenges. But even an engaging Emily wouldn't be enough to carry this book were it not also loaded with appealing and/or compelling secondary and supporting characters and imaginative set scenes. From the Faerie King and Queen, and the human members of the Invisible Order, through piskies, magical creatures, and a vast cast of one-off interesting otherworld players, this book keeps piling on the twists, turns and unexpected developments. This was a wonderful adventure - well written, easily digestible for young and adult readers, and nicely atmospheric. From the first chapter you're hooked; thrown right into the action as 12 year old Emily Snow, the story's protagonist, encounters a battle between the Seelie and Unseelie - piskies (don't call them faeries) who have abandoned their ages old war with the humans and now are immersed in their own civil war. This was a wonderful adventure - well written, easily digestible for young and adult readers, and nicely atmospheric. From the first chapter you're hooked; thrown right into the action as 12 year old Emily Snow, the story's protagonist, encounters a battle between the Seelie and Unseelie - piskies (don't call them faeries) who have abandoned their ages old war with the humans and now are immersed in their own civil war. She'll find herself trapped between the fey and the humans who are dedicated to exterminating them: the Invisible Order. Along the way, she will be helped by neighbor Jack and find there is more to her own family's story/involvement with the fey than she realizes. And she will have to learn who to trust and who not to trust as loyalties shift and people are not always what they seem. The chapters are short and the setting of Victorian England (rather than modern England) makes the story much more interesting (in comparison to similar types of books like Chris Wooding's Malice, in which the modern colloquy and 'hip' kids ruined the magic feel of the story). The story moves quickly and is well paced. There is a broad range of characters to add interest to the story. And although it doesn't have the wit and verve of Eoin Colfer's Artemis stories, or the imagination of Phillip Reeve's Larklight, it does have a tone that is very appropriate for the setting. Most importantly, the conversations felt appropriate and not anachronistic - which is something a lot of YA authors can find difficult. Crilling wrote this in such a way as to be very Victorian England but also not so set in the period as to put off modern readers. The Invisible Order is a fantastic read that weaves faerie lore with historical Victorian London, and engages you in a fast passed, twisty plot, that is witty and suspenseful. Our heroine, Emily Snow may be young, but at 12 years old she's raised her 9 year old brother and herself for the last two years, since her parents death. Her key to survival has been her strength and wit, something she'll rely heavily on as she finds herself in the middle of a war. Both the Unseelie and the Seelie courts The Invisible Order is a fantastic read that weaves faerie lore with historical Victorian London, and engages you in a fast passed, twisty plot, that is witty and suspenseful. Our heroine, Emily Snow may be young, but at 12 years old she's raised her 9 year old brother and herself for the last two years, since her parents death. Her key to survival has been her strength and wit, something she'll rely heavily on as she finds herself in the middle of a war. Both the Unseelie and the Seelie courts are about to unleash destruction on the city of London. Emily, a true seer, gets more than she bargains for when she saves a pesky little piskie named Corrigan. I really like Emily's character. She's tough, educated and the only one who can stop the war that will be the destruction of London. Emily will be tried and tested, as she experiences betrayal more than once, tries to save her kidnapped brother, and she has to learn who she can really trust. In a world of myth and faerie lore, people and things aren't always what they seem. Emily has to decide what the true intentions are of The Invisible Order, the Seelie Court and the Unseelie Court. The fate of London is in her hands as she is the only one who can uncover the riddles and clues that lead to the key that unlocks the gate to the other world. I really liked the characters who assist Emily on her quest. Jack, known as Spring-Heeled Jack, is dashing, and brave. I liked their innocent relationship that can easily become something more later in the series. Corrigan, the piskie who's sarcasm and one liners provided the humor, along with Emily's responses back to him. My favorite is Merlin. Yes, I'm talking about the one and only Merlin, who's been around for centuries. Emily learns her parents are live, she knows Merlin, though she has no memory of it and she plays a bigger role in this war she's now apart of, that started back with the Great Fire of 1666. On the day she found out about the the fey and the hidden war being waged in Victorian London, twelve-year-old Emily woke up praying for snow. Snow would mean that she could stay home with her brother William instead of running through alleys and side streets to get to Mrs. Hobbs to buy a bunch of watercress to sell for the day. But there is no snow and Emily does have to venture out. Unfortunately instead of a day spent peddling watercress in the cold, Emily stumbles upon a faerie battle right i On the day she found out about the the fey and the hidden war being waged in Victorian London, twelve-year-old Emily woke up praying for snow. Snow would mean that she could stay home with her brother William instead of running through alleys and side streets to get to Mrs. Hobbs to buy a bunch of watercress to sell for the day. But there is no snow and Emily does have to venture out. Unfortunately instead of a day spent peddling watercress in the cold, Emily stumbles upon a faerie battle right in a London alley. Emily would love to forget about what she saw and go back to her normal life even if life as an orphan is hard. But the faeries won't let her forget them--not until she gets them something they desperately want. Even if Emily could do that, there's The Invisible Order to contend with. A secret society meant to protect humans from the fey, the Invisible Order wants Emily to work with them instead. Everything Emily knows is soon turned upside down and she has no idea who to trust besides her friend Jack. But can two children possibly rescue Emily's brother and save London before it's too late? Emily doesn't know that answer yet, but she knows she has to try in Rise of the Darklings (2010) by Paul Crilley. Rise of the Darklings is the first book in The Invisible Order trilogy. Crilley combines traditional elements from fairy tales (gnomes, giants, piskies, and even a famous wizard) with a well-realized, completely evocative London setting. The plot is well-written with enough twists to keep readers (and Emily) guessing along with humor and action in spades. Rise of the Darklings truly has it all: action, adventure and faeries all in the beautifully realized setting of Victorian London. Throw in a determined and clever heroine, fast talking characters like Jack and Corrigan, well-dressed gnomes and you have all the makings of a spirited start to a wonderful trilogy. 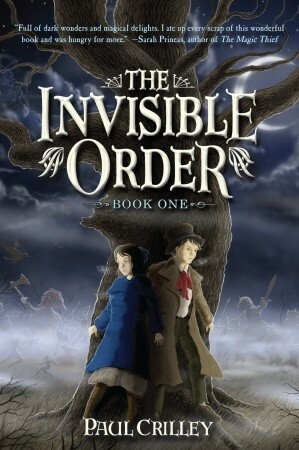 The Invisible Order is written for a middle-grade audience, but readers of all ages may enjoy it. It tells the story of a 12-year-old girl named Emily in Victorian London. Emily's parents disappeared a few years earlier, and she sells watercress for pennies in the street to support herself and her younger brother. One morning, on her way to buy her day's supply of watercress, she stumbles upon a battle between two groups of fairies. She ends up saving the life of a piskie named Corrigan and quic The Invisible Order is written for a middle-grade audience, but readers of all ages may enjoy it. It tells the story of a 12-year-old girl named Emily in Victorian London. Emily's parents disappeared a few years earlier, and she sells watercress for pennies in the street to support herself and her younger brother. One morning, on her way to buy her day's supply of watercress, she stumbles upon a battle between two groups of fairies. She ends up saving the life of a piskie named Corrigan and quickly gets caught in an ancient war involving two opposing fairy courts and a secret society called the Invisible Order, which protects the human world from the fairies. The book has a lot of the standard fantasy tropes: a normal child with an incredible destiny, absent parents, a secret society, etc., but the elements are put together well, and the story takes some unexpected twists and turns. Crilley doesn't shy away from the harsh realities of Victoria life. Emily and her brother share a room with strangers who sleep on the floor, she sells watercress to keep herself and her brother out of the workhouse, and they often go hungry. But the author also creates a magical and strange other world, populated by many different creatures, some of them quite scary. For me, the best part of the book is Emily. She's strong, smart, and likable, without being too perfect. Sometimes she resents being on her own and having to take care of her brother, but she just gets on with it and never drifts into self-pity. Even when her involvement in the fairy takes some horrible turns, she never loses hope and she uses her keen intelligence to solve her problems and stay one step ahead of the villains (although who the villains are can change from chapter to chapter, keeping our heroine on her toes). This book may appeal to fans of the Harry Potter series. I'm not sure how many books there will be in the series, but this one ends on a bit of a cliffhanger, so there's at least one more. I'm definitely looking forward to it. I like this book because it fits so well in a reading ladder (Lesesne, 2010) to develop fantasy fans. Those students who discover fantasy in early elementary school through books like Mary Pope Osborne's Magic Treehouse series will move up the ladder with a book such as this in upper elementary/middle school. Rise of the Darklings is the first book in a set of sequels and provides a strong plot developed through action and character dialogue. The chapters are not terribly long, and there is some I like this book because it fits so well in a reading ladder (Lesesne, 2010) to develop fantasy fans. Those students who discover fantasy in early elementary school through books like Mary Pope Osborne's Magic Treehouse series will move up the ladder with a book such as this in upper elementary/middle school. Rise of the Darklings is the first book in a set of sequels and provides a strong plot developed through action and character dialogue. The chapters are not terribly long, and there is some kind of hook at the end of most chapter to keep readers reading. The plot provides the structure that fantasy newbies need so that they can focus on the events and imagine the characters that have just the right amount of description. From this set of sequels, fantasy readers will continue to more complex plots such as Fisher's Incarceron in junior high and early high school, and when they make it to high school, they will look forward to discovering the wonders of Middle Earth in Tolkien's The Fellowship of the Ring. At twelve years old, Emily Snow has been looking after her younger brother since her parents disappeared. She tries to earn enough money to feed them both by selling watercress on the streets of Victorian London. One cold morning on her way to the watercress vendor, Emily encounters several strange small people having a battle. After the battle, two men approach her to ask her what she witnessed. Emily refuses to tell them, but that is not the last she will hear from them or from the piskies she At twelve years old, Emily Snow has been looking after her younger brother since her parents disappeared. She tries to earn enough money to feed them both by selling watercress on the streets of Victorian London. One cold morning on her way to the watercress vendor, Emily encounters several strange small people having a battle. After the battle, two men approach her to ask her what she witnessed. Emily refuses to tell them, but that is not the last she will hear from them or from the piskies she saw battling. In fact, Emily has just entered the confusing and amazing world of the sidhe where both sides want her to help them and no one is telling the truth. This book is a pleasure to read. Crilley has nicely balanced the world of the fey with the real world of London. Filled with details about the city, this book’s setting is well drawn and delightfully mixed with the magic and wonder of the sidhe world. Crilley also offers a feisty heroine who will delight young readers not only with her intelligence but her own guile as she deals with the faeries and The Invisible Order of humans too. The book reads effortlessly, beginning quickly with the pages whipping by as the adventure heats up. Children looking for a good read should look no further. Teachers as well should look to this as a great classroom read with enough action to keep even the most doubtful listener rapt. A delight of a novel, this is one of the top faery books I have read for younger readers. Appropriate for ages 9-12. Emily Snow is the soul provider for herself and her little brother William. They live in Victorian London where Emily sells watercress for pennies. One morning she turns down a dark alley and witnesses a battle between two different faerie factions. Now that she's seen them, there is no turning back. Emily is thrown into a war that has waged for centuries. On one hand is the King of the Faerie, Dagda, on the other is the Queen, and right in the middle is the Invisible Order, a group of men and wo Emily Snow is the soul provider for herself and her little brother William. They live in Victorian London where Emily sells watercress for pennies. One morning she turns down a dark alley and witnesses a battle between two different faerie factions. Now that she's seen them, there is no turning back. Emily is thrown into a war that has waged for centuries. On one hand is the King of the Faerie, Dagda, on the other is the Queen, and right in the middle is the Invisible Order, a group of men and women sworn to stop Faeries from taking over the world. The problem is that Emily doesn't know who is telling her the truth, and when she discovers she is the only one that can re-open the gates to faerie, who will she give the key too. This is a really fun book that younger readers will enjoy. Emily is a spunky character who misses her parents and fights to keep herself and her brother together. She is brave and follows through with what she knows is right. The funnest element in the story is that people seem to recognize Emily, people she's never met, and they believe she is the key in both the past and the present to the Faerie kingdom. I also like the main side character, Spring-Heeled Jack, a pick-pocket that remains at Emily's side despite the odds. He is a cool character that has inside knowledge of the streets of London and is able to get Emily into and out of places. Since her parent’s disappearance, Emily Snow has done whatever she can to provide for herself and her younger brother in Victorian England. But one day she witnesses a fierce battle between two factions of short humanoid creatures in a back alley. From that point nothing will ever be the same. Her eyes are opened to a new world of rival mythical beings living in close quarters with humans, and a human society (The Invisible Order) bent on either watching or destroying such creatures. In the end it appears everyone needs her help; but who deserves her trust? And what will she be willing to sacrifice to keep her world safe? Another fun audio-book for the commute. I finished listening to this book today on my drive to work. Honestly, it's proving difficult to decide how I feel about it. Rise of the Darklings is a young adult fantasy about an orphaned 12 year old girl who must protect her brother and the city of London from an ongoing war between two factions of faerie-kind and a small group of humans called the Invisible Order. I enjoyed the book, but it left much to be desired. On the one hand, I liked the different f Another fun audio-book for the commute. I enjoyed the book, but it left much to be desired. On the one hand, I liked the different faerie creatures and the Victorian London setting. I enjoyed the characters of Corrigan (a piskie) and Mr. Pemberton (a gnome). Their sarcasm and eccentricities offered a splash of character to an otherwise average cast. The other characters hinted at some depth of personality, but we never get to see those personalities develop much. I felt the same way about the plot. Crilley explains just enough that the story makes sense, but not enough to feel immersed in the conflict. Rise of the Darklings is probably one of my favorite reads so far for 2011. The combination of quick paced adventures, folklore and fairy creatures, and unique in detail characters make this a thrilling read. The whole story was incredibly fast-paced which made it hard to put the book down. This could've been due to the short chapters but a part of it could've been due to the quick plot movement that the author us uses. There is never too much time spent on one idea. But don't be fooled because Rise of the Darklings is probably one of my favorite reads so far for 2011. The combination of quick paced adventures, folklore and fairy creatures, and unique in detail characters make this a thrilling read. The whole story was incredibly fast-paced which made it hard to put the book down. This could've been due to the short chapters but a part of it could've been due to the quick plot movement that the author us uses. There is never too much time spent on one idea. But don't be fooled because each plot element is detailed enough that you have a rounded idea of what is happening and a detailed character. There are parts of the book that really had me feeling for all the characters involved. Some of the characters that I really enjoyed included Emily who is detailed and three-dimensional as well as Spring heeled Jack and the little pixie who added a little bit of humor to the story. The book was also incredibly detailed for Victorian era London and really allowed both young readers and older readers to get the feeling of what it would've been like living in this Victorian era London. He has written eight novels, worked on five computer games, and also written comics for IDW. His previous novels include The Invisible Order books, a middle grade series Paul Crilley is a Scotsman adrift in South Africa and has been writing professionally for the past 17 years. In that time he has worked on over thirteen television shows, one of which was nominated for an international Emmy award.